Long neglected in the annals of American music, the Nutmeg State's influence on the history of rock'n'roll deserves recognition. 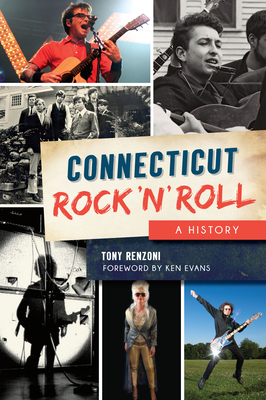 Connecticut's musical highlights include the beautiful harmonies of New Haven's Five Satins, Gene Pitney's rise to fame, Stamford's the Fifth Estate and notable rockers such as Thurston Moore of Sonic Youth, Rivers Cuomo of Weezer and Saturday Night Live Band's Christine Ohlman. Rock Hall of Famers include Tina Weymouth and Chris Frantz of the Talking Heads and Dennis Dunaway of the Alice Cooper Band. Some events became legend, like Jimi Hendrix's spellbinding performance at Yale's Woolsey Hall, Jim Morrison's onstage arrest at the New Haven Arena and teenage Bob Dylan's appearance at Branford's Indian Neck Folk Festival. With in-depth interviews as well as rare, never-before-seen photos, author Tony Renzoni leads a sonic trip that captures the spirit and zenith of the local scene.